In this first article, we will focus on Content Categorization. It is the first of the 10 Key Elements of Enterprise Information Architecture and , surprisingly, the one that is most often overlooked. If you currently have SharePoint installed in your environment and are encountering issues, such as little organization, users unable to find their content, low adoption rate, etc., then you have most likely implemented your solution with little to no Information Architecture. Content Categorization and classification is the process by which we identify and group content. One key success factor for all SharePoint implementations is to reduce, if not eliminate, the question “where do I store and manage my content”. Content Categorization and classification aids with this by providing a specific location and manner by which users store and manage their content. Content Categorization and classification is one of the primary ways we query content for improved search relevancy and aggregation. Content Classification consists of labeling types of content using labels that precisely describe what the content is. For example instead of all documents being labeled as merely a Document type, we classify our documents with more precise labels; such as Policy Document, Client Contract Document, Vendor Contract Document, Project Plan Document, Medical Benefit Document, etc. 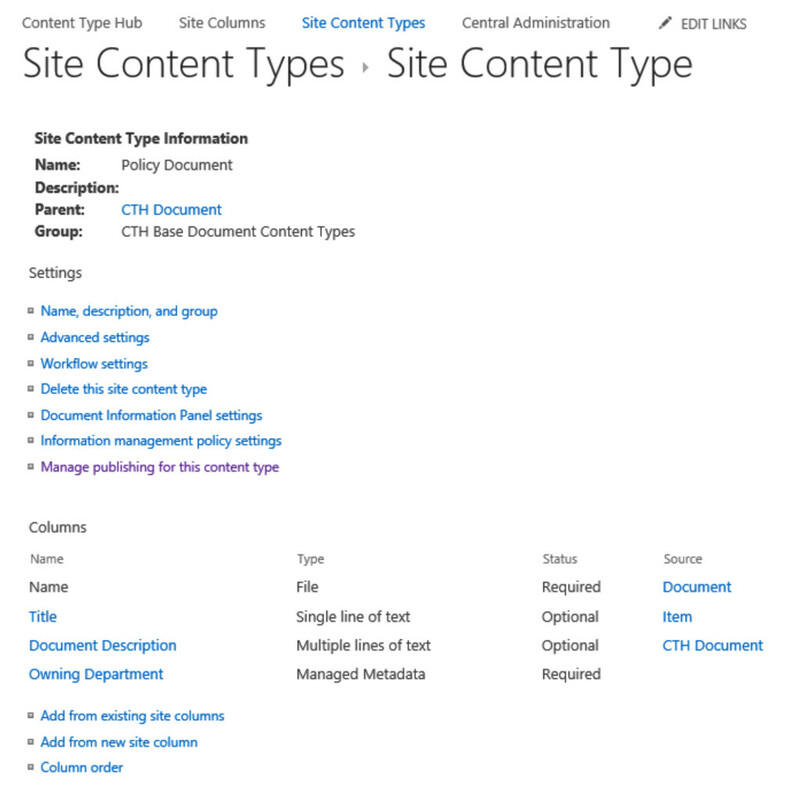 Content Classification in SharePoint is accomplished by using content types. A content type defines a single data type, such as Policy Document, and supports associating metadata, a template document, workflow and policies. Once your content has been classified, it becomes a relatively simple process to create search scopes (result sources) and points of aggregation. For example, it is quite easy to create a result source containing all documents of type Policy Document. We can then search all documents of type Policy Document and/or aggregate all Policy Documents to a policy book. Grouping consists of grouping content of similar type. For example a document library, in SharePoint, named Documents really doesn’t have much meaning and certainly doesn’t tell a user what is stored in it. However, a document library named Policy Documents or Benefit Documents clearly defines what is contained within. Another example would be a Meeting Documents library, on a project site. The Meeting Documents library might contain meeting agenda, meeting minutes and meeting action items documents. In this example, the Meeting Documents is the document grouping principal and is a container for managing all documents related to project meetings. Content Grouping isn’t limited to lists and libraries. Each container level in SharePoint can be used to apply grouping principals. Each of the following is a grouping container in SharePoint. SharePoint Farm – The top-most grouping level in SharePoint. A corporate solution will have 1 to many SharePoint farms. Web Application – Each SharePoint farm will include 1 to many web applications. Site Collection – Each web application will contain 1 to many site collections. Top-level Site – Each site collection will have a single top-level site. List – Each top-level site can have 0 to many lists. Document Library – Each top-level site can have 0 to many document libraries. Sub-sites – Each top-level site can have 0 to many sub-sites. List – Each sub-site will have 0 to many lists. Document Library – Each sub-site can have 0 to many document libraries. As you can see there are many grouping levels that can be applied to your SharePoint implementation. Each of these grouping levels has a very specific purpose and is used for many different reasons. The goal is to reduce the use of folders and expand them to document libraries instead. It is also very common to group similar information, by topic, by site. For example, you may wish to have a sub-site, below the top-level site for each department, titled Policies & Procedures. This site would contain many lists and libraries all related to human resources policies & procedures; i.e. policy documents, procedure documents, FAQ’s, glossary terms, etc. The regular use of folders in libraries is not considered a best practice. There are very specific cases when folders do make sense and are used; however, these cases are limited.